Alan Grosset, lawyer. Born 18 January, 1942, in Edinburgh. Died: 20 August, 2018, aged 76. Alan Grosset, who has died aged 76, was a highly regarded and successful ­Edinburgh solicitor who ­combined a lifelong love of sport with the application of his professional acumen to become an acknowledged leader in the field of sports law. An enthusiastic supporter of, and shrewd adviser, to a raft of sporting organisations, he held many prestigious positions. These included membership of the board of the Scottish Sports Council (later sportscotland) for 18 years including eight years as vice chair, inaugural chair of the Scottish Sports Association, president of the Scottish Lawn Tennis Association and later honorary vice president, council, member of the Lawn Tennis Association in London for nine years, chair of the Confederation of British Sport and vice chair of the Sports Dispute Resolution Panel. In his early years on the board of the Scottish Sports Council, many small sports clubs had cause to be grateful to him as he was the prime mover behind their obtaining significant reductions in rates liability after arguing they paid a disproportionate amount compared to their English and Welsh counterparts due to different valuation methods. He was a great proponent of the importance of clubs having proper constitutions and encouraged many in that respect. While acting as a ­consultant for sportscotland on retirement, he did invaluable work advising many sports governing bodies on the ­benefits of incorporation as limited companies and the consequent responsibilities of directors. In his professional life he was a partner of Alex. Morison and Co, W.S., later Morisons, Solicitors, in their corporate department and head of sports law, latterly also involved in mediation work. He was one of the original “troubleshooters” appointed by the Law Society of Scotland to assist people who considered their solicitor to have been negligent to locate and engage another solicitor to handle their claim, a task requiring considerable nous, tact and integrity. He was a council member of the Writers to the Signet Society, founder secretary of the Scottish branch of the Society for ­Computers and the Law, a member of the Law Society’s Committee for E-Commerce, Depute Clerk of the NHS [Scotland] Tribunal and public interest member of the Insolvency Permit Committee of the Scottish Institute of Chartered Accountants. Alan George Grosset was born in Edinburgh to George and Margaret [née McRobbie], an elder brother of Margo. His father was a solicitor, having also served his apprenticeship with Alex Morison and Co., before becoming legal adviser to the National Coal Board in Scotland. Initially the family lived in Piershill Place prior to moving to a newly built bungalow in Woodlands Grove, Duddingston. Mr Grosset attended the Royal High School for both primary and secondary education when still housed in its iconic building on Regent Road and in primary school was Proxime Accessit to the Dux (runner-up). Aged five, Mr Grosset ­suffered from polio which resulted in a lengthy period of hospitalisation and left him with a deficit in strength on his right hand side. Although that slightly restricted his participation in sport, it did not diminish his interest or aspirations. He compensated in racquet games by assiduous practice to develop slice shots ­enabling him to play badminton at league level for New Restalrig Church team and tennis at Abercorn Club, later being awarded an honorary membership. Football was another interest and he always harboured fond memories of attending his first New Year’s derby match as a Hibs fan aged five. He was introduced to golf as a youngster on family holidays in North Berwick where he learned to play on the nine hole course next to the Marine Hotel, the precursor to a long association with the sport. After leaving school in 1959, he studied at Edinburgh ­University and graduated M.A. LL.B. before joining Alex Morison and Co, with whom he became managing partner and remained all his professional life till retirement in 2002. He married Gloria Gething from the north-east of England and had two children, Sara, a Scottish hockey international and Robin. Later they separated and divorced. His services to myriad sporting organisations, though often unseen, were nevertheless hugely appreciated. Two examples reflect the breadth of his activity – in 1992, Scottish Athletics appointed him an ­honorary life member for his contribution while in 2007 the Scottish Orienteering Association praised him for his input to the “modernisation” of the running of the sport. He was a frequent speaker on sports law and a regular contributor to publications on the subject. A keen member of Duddingston Golf Club for 49 years and Captain in 1992/4, he relished the game and its fellowship. 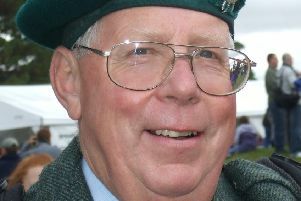 Inevitably with his background, he was involved in the administrative aspect, latterly with the Lothians Golf Association Executive and as spokesperson for his club in connection with the merger of the men’s and women’s associations, when he withdrew support for it because of concerns over voting structures. He was also a member of the Royal High School Club[former pupils] committee and president in 2004. Apart from his family to whom he was devoted, other interests included reading and watching Boroughmuir’s rugby matches at Meggetland near his home. An astute and sociable individual, he also possessed a sharp sense of humour, an asset in occasionally defusing tension at meetings.